Desulfurispirillum indicum strain S5T is a strictly anaerobic bacterium isolated from river sediment in Chennai, India. D. indicum belongs to the deep branching phylum of Chrysiogenetes, which currently only includes three other cultured species. Strain S5T is the type strain of the species and it is capable of growth using selenate, selenite, arsenate, nitrate or nitrite as terminal electron acceptors. The 2,928,377 bp genome encodes 2,619 proteins and 49 RNA genes, and the information gained from its sequence will be relevant to the elucidation of microbially-mediated transformations of arsenic and selenium, in addition to deepening our knowledge of the underrepresented phylum of Chrysiogenetes. Desulfurispirillum indicum type strain S5T (=DSM 22839T =ATCC BAA-1389T) was isolated from an estuarine sediment for its ability to grow on selenate . D. indicum belongs to the Chrysiogenetes, a deeply branching phylum that includes three other cultured species: Chrysiogenes arsenatis , Desulfurispirillum alkaliphilum , and Desulfurispira natronophila . The four microorganisms are all strict anaerobes and are capable of using a variety of terminal electron acceptors and a few short-chain fatty acids as electron donors and sources of carbon. Specifically, D. alkaliphilum can respire sulfur, fumarate, nitrate, nitrite and chromate, while C. arsenatis can grow using arsenate, nitrate and nitrite. Desulfurispira natronophila can grow under moderate haloalkaline conditions, respiring sulfur or arsenate. Thus, D. indicum is the only characterized Chrysiogenetes that is capable of dissimilatory reduction of both arsenate and selenate, in addition to nitrate and nitrite respiration. 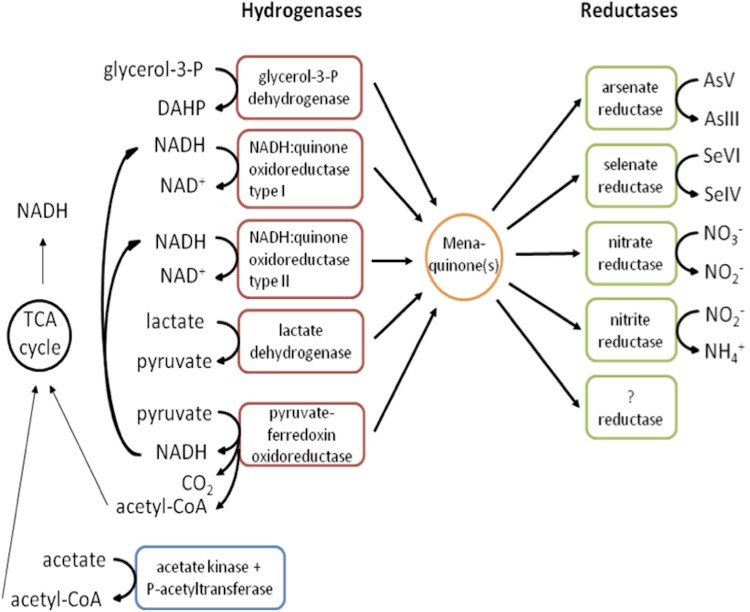 This feature makes it an ideal system to identify and elucidate the pathways for selenate and arsenate oxyanions respiration and their regulation. Here we summarize the features of D. indicum and present a description of its sequenced genome, which is the first sequenced genome of a member of the phylum Chrysiogenetes. D. indicum forms a deeply branching clade related to Chrysiogenes arsenatis, an arsenate respiring bacterium that cannot use selenate as electron acceptor, and Desulfurispira natronophila that only uses sulfur or arsenate as terminal electron acceptor (Table 1). Interestingly, its closest relative D. alkaliphilum, with a 16S rRNA gene identity of 99.8%, is not capable of either arsenate or selenate respiration. The phylogenetic position of D. indicum relative to its closest relatives is shown in Figure 1. 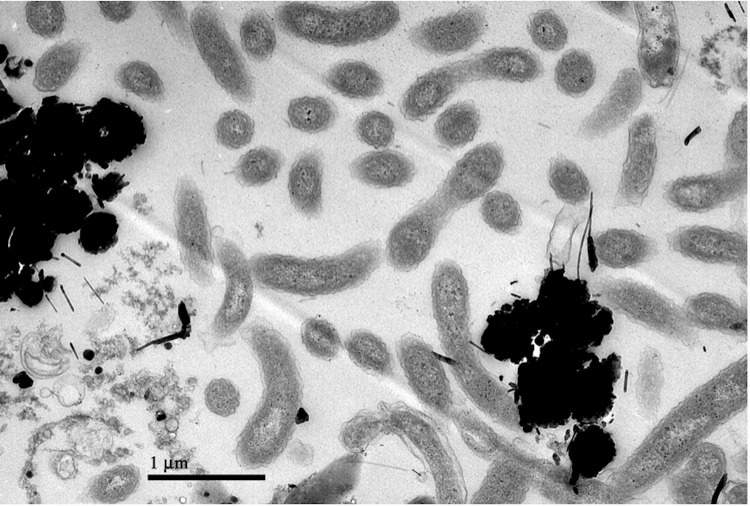 This Gram-negative bacterium is spiral-shaped and accumulates electron-dense granules when grown in the presence of selenium (Figure 2). 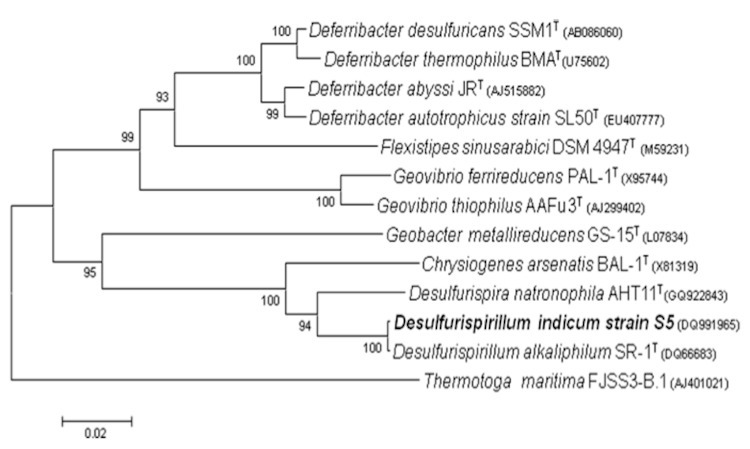 Phylogenetic tree highlighting the position of Desulfurispirillum indicum strain S5 relative to other type strains within the Chrysiogenetes and Deferribacteres phyla. The strains and their corresponding GenBank accession numbers for 16S rRNA genes are as indicated (type strain=T). The tree, based on 1,251 positions, was built with Mega 4  using the Neighbor-Joining method and 1,000 bootstrap replications. T. maritima was used as an outgroup. Transmission electron micrograph of D. indicum S5T. The genome of D. indicum strain S5 was selected for sequencing in 2007 by the DOE Joint Genome Institute as a part of the DOE JGI Community Sequencing Program. The Quality Draft (QD) assembly and annotation were completed on July 3, 2009, and presented for public access on December 31, 2009 in the ORNL database. The final complete genome was made available on September 14, 2010. Table 2 presents the project information and its association with MIGS version 2.0 compliance . D. indicum was grown in mineral salt medium at 28°C with 20 mM pyruvate as carbon source and 10 mM nitrate as electron acceptor, as previously described [12,16]. Genomic DNA was isolated from an 80-ml culture using a phenol-chloroform extraction protocol . The draft genome of Desulfurispirillum indicum was generated at the DOE Joint Genome Institute (JGI) using a combination of Illumina  and 454 technologies . For this genome, we constructed and sequenced an Illumina GAii shotgun library which generated 16,867,720 reads totaling 607 Mbp, a 454 Titanium standard library which generated 234,340 reads and paired end 454 library with average insert sizes of 6, 18 and 23 Kbp which generated 475,179 reads totaling 291 Mbp of 454 data. All general aspects of library construction and sequencing performed at the JGI can be found at the JGI website . The initial draft assembly contained 117 contigs in 1 scaffold. The 454 Titanium standard data and the 454 paired end data were assembled together with Newbler, version 2.3. The Newbler consensus sequences were computationally shredded into 2 Kbp overlapping fake reads (shreds). Illumina sequencing data was assembled with Velvet, version 0.7.63 , and the consensus sequences were computationally shredded into 1.5 Kbp overlapping fake reads (shreds). We integrated the 454 Newbler consensus shreds, the Illumina Velvet consensus shreds and the read pairs in the 454 paired end library using parallel phrap, version SPS - 4.24 (High Performance Software, LLC). The software Consed [22-24] was used in the following finishing process: Illumina data was used to correct potential base errors and increase consensus quality using the software Polisher developed at JGI (Alla Lapidus, unpublished). Possible mis-assemblies were corrected using gapResolution (Cliff Han, unpublished), Dupfinisher , or sequencing cloned bridging PCR fragments with subcloning. Gaps between contigs were closed by editing in Consed, by PCR and by Bubble PCR (J-F Cheng, unpublished) primer walks. A total of 764 additional reactions were necessary to close gaps and to raise the quality of the finished sequence. The total size of the genome is 2,928,377 bp and the final assembly is based on 220 Mbp of 454 draft data which provides an average 108 × coverage of the genome and 607 Mbp of Illumina draft data which provides an average 222 × coverage of the genome. The genome includes a single circular chromosome of 2,928,377 bp (56.1% GC content). In total, 2,668 genes were predicted, 2,619 of which are protein-coding genes. Of these, 2,137 protein coding genes were assigned to a putative function while those remaining were annotated as hypothetical proteins. 91 protein coding genes belong to 25 paralogous families in this genome corresponding to a gene content redundancy of 3.4%. The properties and the statistics of the genome are summarized in Table 3 and Table 4.
b) Also includes 49 RNA genes. It does not include 48 pseudogenes. D. indicum strain S5 can use nitrate, nitrite, arsenate or selenate as the terminal electron acceptors for growth, while using the electron donors acetate, lactate or pyruvate [12,33]. The inspection of the strain S5 genome has confirmed the physiological data, and furthermore has enabled the discovery of sequences encoding other DMSO-like terminal reductases, as well as enzymes for the oxidation of additional electron donors (  and Fig. 3). The discovery of such sequences suggests that the respiratory capabilities of strain S5 are broader than expected, and allows us to formulate hypotheses on further substrates and TEAs to be tested. In particular, we are interested in the dissimilatory reduction of selenium and arsenic oxyanions. Although the reduction of selenium is an important mode of respiration, the genes responsible for this process remain largely uncharacterized and virtually nothing is known about their regulation, or their interactions with other respiratory pathways. Diagram of the anaerobic pathways of respiration in D. indicum strain S5, based on genomic and physiology data. Question mark indicates the presence of sequences encoding terminal reductases whose substrate is unknown. Besides Desulfurispirillum indicum, the genomes of only four bacterial species capable of using selenate reduction for growth are currently available: Aeromonas hydrophila , Desulfitobacterium hafniense , Sulfurospirillum barnesii  and Thauera selenatis [37,38]) . The genome of the selenite respirer Bacillus selenitireducens  has also been sequenced. Comparisons of the DMSO-like sequences from these genomes will help to generate testable hypotheses about functions and substrates of the various terminal reductases. The work conducted by the US Department of Energy Joint Genome Institute is supported by the Office of Science of the U.S. Department of Energy under Contract No. DE-AC02-05CH11231. This work was funded in part by NSF grant EAR 0843295. Garrity GM, Holt JG. Phylum BV. Chrysiogenetes phy. nov. In: Garrity GM, Boone DR, Castenholz RW (eds), Bergey's Manual of Systematic Bacteriology, Second Edition, Volume 1, Springer, New York, 2001, p. 421. Garrity GM, Holt JG. Class I. Chrysiogenetes class. nov. In: Garrity GM, Boone DR, Castenholz RW (eds), Bergey's Manual of Systematic Bacteriology, Second Edition, Volume 1, Springer, New York, 2001, p. 421. Garrity GM, Holt JG. Order I. Chrysiogenales ord. nov. In: Garrity GM, Boone DR, Castenholz RW (eds), Bergey's Manual of Systematic Bacteriology, Second Edition, Volume 1, Springer, New York, 2001, p. 421. Garrity GM, Holt JG. Family I. Chrysiogenaceae fam. nov. In: Garrity GM, Boone DR, Castenholz RW (eds), Bergey's Manual of Systematic Bacteriology, Second Edition, Volume 1, Springer, New York, 2001, p. 421. Han C, Chain P. Finishing repeat regions automatically with Dupfinisher. In: Proceedings of the 2006 international conference on bioinformatics and computational biology HR, Arabnia, H., Valafar, editor2006. CSREA Press. p 141-146.